Powered by Adani, Mahindra and the Times of India, the respected Sadhguru Jaggi Vasudev of Isha Foundation has called the Nation to Rally for Rivers, and to come together for saving India’s rivers. The campaign has been received well by one and all the Nation is now rallying behind its rivers, which are also considered holy and divine in our culture and civilization. However, the key question here is how much of this would actually help in safeguarding our rivers from the rapidly intensifying challenges of over-exploitation and the general lack of political will for river and riverfront protection? While one of the apparent objectives of the Rally for Rivers campaign is to raise awareness on the need to protect our rivers, this objective certainly seems to be achieved, with greater sensitization and awareness being generated in the masses, especially the youth of the country. However, India being a primarily agrarian economy, no one can be more aware and sensitive about the role rivers and canals play in securing livelihoods than the 70% of Indian population which lives in villages. In the cities of India as well, water is becoming an increasingly scarce resource each passing day. The urban resident is thus relatively aware of the need to protect water, and the simultaneous need to protect the source of fresh water, which are rivers, lakes and ponds. The problem is not in the lack of awareness or sensitization in the people, the problem is the lack of actual will to act for rivers by writing to the local and state administration and exerting political pressure on them to act in the interest of the rivers, and not against the rivers. Will the Rally for Rivers thus be able to urge citizens to work with the elected representatives for protecting India’s rivers, is going to be the actual litmus test of this campaign. Another attempt of the Rally for Rivers seems to be to urge the scientific and research community to focus on rivers, as it requests this section of the society to contribute its ideas for creating a road map to rejuvenate India’s depleting rivers. However, a quick visit on the References page of the Rally for Rivers website is enough to understand that all the research needed to protect India’s rivers is already in place. Thus, with awareness, sensitivity and research in place to a great extent, it is political will and political will alone that is the missing ingredient in protecting India’s riverine ecosytems. 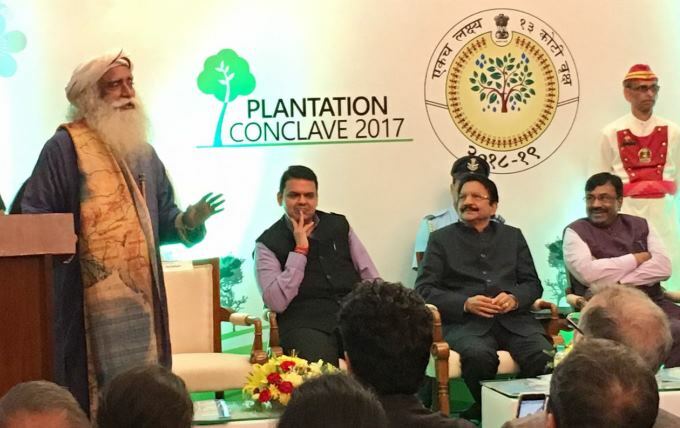 Thus, while banners, marches and live band performances will certainly help create more awareness, the success of the Rally of Rivers campaign will depend largely on how well is the respected Sadhguru Jaggi Vasudevji able to communicate the urgency of acting to protect our rivers to the politicians and political class that he is meeting. The timing aspect of the campaign will also be critical so that the right political leaders can be interacted with at the right time to get the message across. For example, it does not become clear as to why did the Rally for Rivers campaign mark its presence in Mumbai (Maharashtra) on 17 September 2017, when the Prime Minister of India Shri Narendra Modi was inaugurating the world’s second largest dam on River Narmada in the neighbouring state. The Sardar Sarovar Dam has been a controversial one and the presence of Sadhguru Jaggi Vasudevji during the inauguration ceremony would have only helped demystify the more than four decade long issues around this project for the masses, before this project could be dedicated to the people of India. Then, there are issues around rivers in India that need special focus and attention. The most significant among these is the illegal sand mining in the floodplains of most of our rivers. Will the Rally for Rivers campaign be able to highlight this issue, so as to ensure the framing of stricter laws for stopping this destructive menace, which is otherwise an “industry” worth billions of rupees in hard cash. Or highlight the plight of those who are fighting this losing battle, with everything including their life at stake. Some, who have even lost their lives to this cause. Sadhguru Jaggi Vasudevji visiting the Matri Sadan Ashram in Haridwar for instance, will certainly boost the morale of Swami Shivanandji, who is a Sadhu fighting the sand mining mafia all on his own, for the sake of the Holy River Ganga. It may also bring some peace, to the otherwise gentle Swami Nigamanandaji, who gave up his life after fasting for almost 4 months, for this same cause. Or perhaps visit Uttar Pradesh’s former Chief Minister Akhikesh Yadav and after reminding him of the 2013 incident, tell him that Durga Shakti Nagpal should not have been referred to as an “errant child who needed correcting” but a brave IAS Officer who needed to be rewarded for challenging the status quo on illegal sand mining of River Yamuna around Delhi. Or visit the family members of many others who have lost their lives either as honest officers trying to stop illegal mining, or as journalists and citizen activists highlighting this same cause in public. Whatever be the journey and destinations chosen by the respected Sadhguru Jaggi Vasudevji for the Rally for Rivers, it again needs to be emphasized that the success of this campaign will directly depend on how much it is able to influence the political class and create a political will for preserving our rivers. If the campaign is able to make our politicians understand that rivers are not mere pipelines carrying water and providing sand, but actual living systems that need due attention and care for them to survive, I think it would have made its mark as a successful environmental campaign which ensured the Rights of rivers to be protected. Image source: Rally for Rivers website. Disclaimer: The view expressed by the author are personal and may not represent the views of the Delhi Greens Blog or Delhi Greens organisation. Read your article on LinkedIn. Happy to note the astute observations for this campaign.